Thai Yoga Massage is a practice that entices the muscular-skeletal system to relax and open deeply through gentle twisting, bending and stretching. It allows life energy to flow freely through the body's meridian pathways, otherwise known as "sen lines" in the Thai tradition. Traditional Thai therapy integrates breathwork with ancient techniques dating back to the medical practices and teachings of Jivaka Komarbhaccha - an Ayurvedic physician who lived in the Bihar Province of northern India duringthe 4th century BC. This workshop is open to everyone at any level of experience. A great experience for yoga teachers and massage therapists or for anyone interested in greater wellbeing gained through healing bodywork. Bring a friend or a partner to work with or come alone to be paired with someone. Hours may be applied towards an NCBTMB-approved certificate of completion. Register with a friend or partner $125.00 per person by April 7. Please register early. This event has spaces for just 12 students. Includes a catered lunch on-site with vegetarian option. If registering with a friend or partner, both registrations must be received by April 7 to qualify for early-bird pricing. ​​Payments made via PayPal with fast & secure checkout. 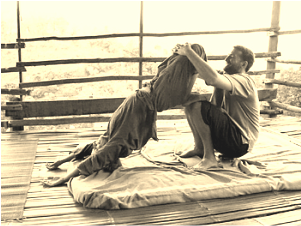 Checks can be made out to One World Wellness and mailed to 967 N. High Street, East Haven CT.
Matthew Mandeville giving a traditional Thai massage at LaHu Village, Thailand. The Thai Therapy Practitioner Certificate training program is offered to students using the time-honored apprenticeship model of instruction. For information about Practitioner Certification training, please contact Matthew via e-mail at info@therathai.com or by phone at 615.686.0944.